The SteerROVER™ portable motorized scanner is based on the field-proven MapROVER™scanner, but adds steering capabilities so that users can position it from a distance. 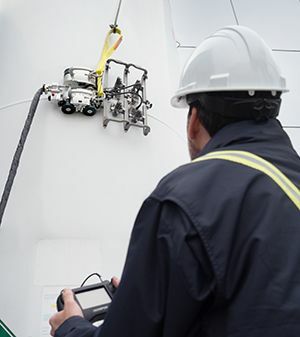 This functionality is useful when inspecting large ferromagnetic surfaces, such as pressure vessels and tanks, where the area to be inspected is out of the operator’s reach. 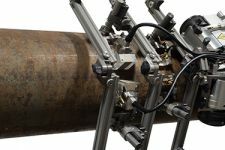 The scanner can be configured for corrosion mapping with a motorized raster arm or for weld inspection (both longitudinal and circumferential) with a probe holder rack. The scanner is controlled using an intuitive touch screen remote control, so there is no need to bring a laptop to the inspection site. The only connection is between the power controller and the OmniScan® or FOCUS PX™ flaw detector’s encoder input. 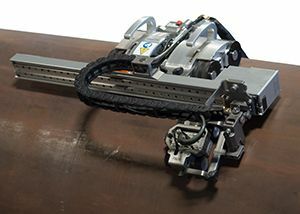 The SteerROVER scanner can be ordered in different configurations depending on the application (weld or corrosion) and by combining different raster arm and cable length options. The SteerROVER scanner and probe holder rack can bend to perform inspection of longitudinal welds. The SteerROVER scanner, when fitted with a motorized raster arm, is a powerful solution for corrosion inspection in remote locations. Steerable scanner comprised of two pods with independent motors and four strong magnetic wheels. Touch screen remote with two joysticks; configure so that scanner movement requires constant user input (jog) or so that one input starts the scanner and a second stops it. Two complete automatic raster scan patterns are available. Can be ordered with two choices of motorized raster arms for corrosion inspection or a probe holder rack for weld inspection with four probes (increase to six probes with optional probe holders). Emergency-stop buttons located on the scanner and on the power controller. Divisible cable conduit umbilical offers cable protection and flexible configurations. Detachable umbilical cables with divisible protection sleeve. Encoder cable linking to current generation OmniScan and FOCUS instruments. Motorized raster arm or probe holder rack (depending on configuration). Spring-loaded probe holder compatible with the HydroFORM® scanner and Dual Linear Array™ corrosion probe. Two adjustable yokes to hold phased array probes (up to 57.6 mm wide and 48.5 mm long). Two adjustable yokes to hold TOFD-P/E probes (up to 45 mm wide and 36.8 mm long).